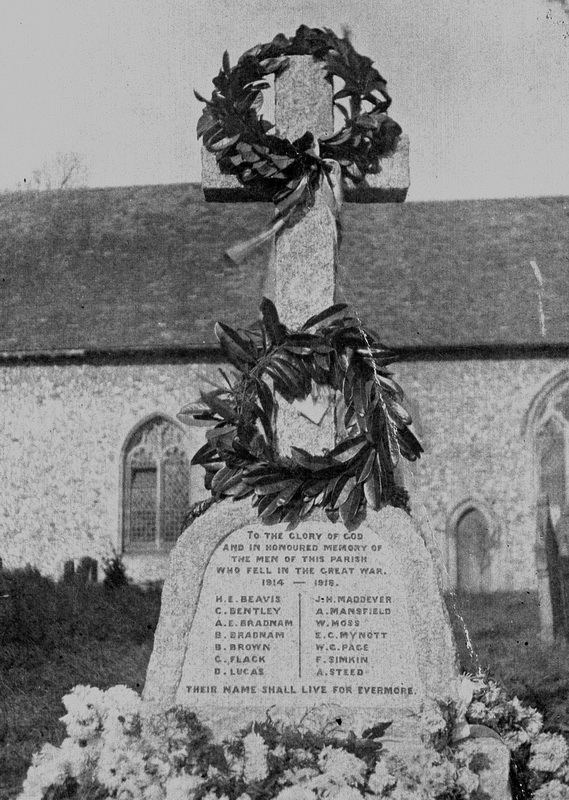 The war memorial in the churchyard was unveiled and dedicated on 24 October 1920. Fourteen men from the village who lost their lives in the First World War are commemorated and another four names were added after the Second World War. There are brief details below. Please get in touch if you would like to know more or indeed have information to add. We are particularly looking for photographs of the men as part of an ongoing project to make sure they are remembered. Harold Edward BEAVIS 15th Suffolk Yeomanry. Died 13/11/1917, aged 21, buried in the Cairo War Memorial Cemetery, Egypt. Charles Alfred BENTLEY 9th Battalion Loyal North Lancashire Regiment. Died of wounds 6/11/1918, aged 32, buried in La Cheppe (Mont-Frenet) French National Cemetery. Albert Edward BRADNAM 11th Battalion, Suffolk Regiment. Died on 30/7/1916 in the military hospital at Charlton upon Medlock of wounds received on the first day of the Battle of the Somme (1/7/1916), aged 21. Buried in the churchyard (military headstone). Bennett BRADNAM 11th Battalion, Suffolk Regiment. Died 13/9/1917, aged 27, buried in Jeancourt Communal Cemetery Extension, Aisne, France. Bertie BROWN 1st Battalion, Suffolk Regiment. Died of wounds 26/3/1915, aged 23, buried Dranouter churchyard, Belgium. George FLACK 1st Battalion Rifle Brigade. Died at Le Cateau on 26/8/1914, aged 26, commemorated on La Ferte-sous-Jouarre Memorial, Seine-et-Marne, France and also on Duxford war memorial. Dennis LUCAS 8th battalion London Regiment (PO Rifles). Died of wounds 2/12/1917, aged 38, buried in Rocquigny-Equancourt Road British Cemetery, Manancourt, Somme, France. James Howard MADDEVER Canadian Machine Gun Corps 2nd Battalion. Died 27/9/1916, aged 28, buried in Contay British Cemetery, Contay, Somme, France. Albert MANSFIELD 2nd/1st Suffolk Yeomanry. Accidentally killed on 16/11/1916 at Warren Heath Camp, Purdis Farm, Ipswich, aged 22, buried in the churchyard (military headstone). William MOSS 6th Battalion Alexandra, Princess of Wales Own (Yorkshire regiment). Killed in action 27/9/1917, aged 38, in Flanders, commemorated on the Tyne Cot Memorial, Belgium. Edward George MYNOTT 2nd Battalion, Suffolk Regiment. Died at Arras 11/4/1917, aged 22, commemorated on the Arras Memorial. William George PAGE 1/5th Battalion, Suffolk Regiment. Discharged on 26/10/1918 on health grounds. Died at home on 13/11/1919, aged 36, buried in an unmarked grave in the churchyard. Frank SIMKIN D Battery, 63rd Brigade, Royal Field Artillery. Died 3/12/1917, aged 42, commemorated on the Cambrai Memorial, Louveval, Nord, France. A STEED It has not been possible so far to trace this man. 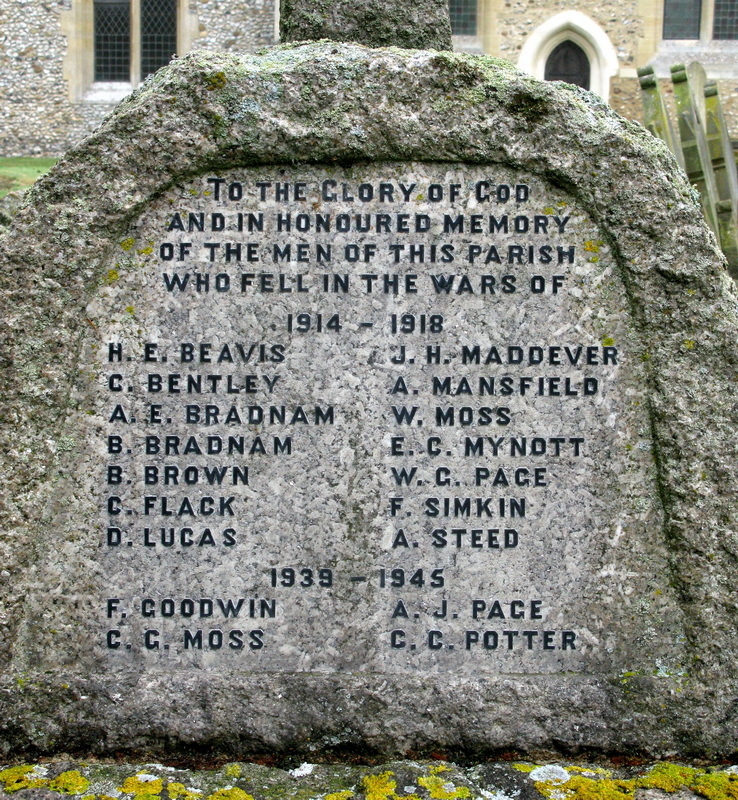 The war memorial today, with additions made after the second World War. Frank GOODWIN Home Guard. Died 4/9/1941 at Addenbrookes Hospital following injury, aged 21, buried in an unmarked grave in the churchyard, commemorated by the Municipal Borough of Cambridge section of the Civilian War Dead Register. Cyril George MOSS 2nd Battalion, Irish Guards. Died 5/8/1944, aged 32, buried in the St Charles de Percy War Cemetery, Calvados, France. Albert John PAGE 139 Field Regiment, Royal Artillery. Died 6/6/1943, aged 37, buried in Delhi War Cemetery, India. Cyril Christopher POTTER 2nd Battalion Coldstream Guards. Died 4/3/1943 in North Africa, aged 33, buried in Medjez-el-Bab War Cemetery, Tunisia. 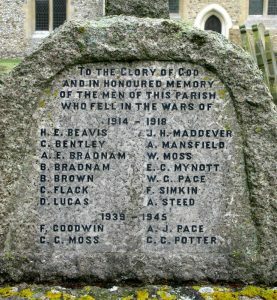 To find out more about the West Wickham War Memorial and the men on it from World War I click on link to download an acrobat file.